STABILO Pen 68: encourage your creativity with 47 brilliant colors! Pen 68 has been designed to encourage your creativity and will always give you the best results. It’s available in 47 brilliant and luminous colors, including 6 fluorescent shades. Whether you are a budding artist or just drawing for fun, this premium fibre-tip pen is for you. If you are looking for countless drawing options and high efficiency, STABILO Pen 68 is going to be your new best coloring friend. It was this fibre-tip pen that gained STABILO its reputation for unbeatable German premium quality since 1966. This product will really surprise you with its high performance – 24-hour cap off time, water-based odourless ink, high brilliance and luminosity. Start coloring now in a whopping range of 41 colors plus 6 fluorescent shades. A set that nobody has – except you. Everyone has their own personal style. Don’t just show it on paper, show it with your pens! The rollerset is the perfect solution for bringing more organisation and individuality to the premium STABILO Pen 68 felt-tip pen. The new “Individual. Just like you” edition is taking design to a whole new level. The combination of design and algorithm guarantees that every rollerset is unique. It’s not only varied on the outside, but also on the inside: the premium felt-tip pen comes in 30 colors – including five bright neon shades – to add a splash of color to your day! The rollerset is not only perfect for on the go – it’s also an ideal gift. STABILO Pen 68 Living Colors Edition: Bring your colors to life! The STABILO Pen 68 Living Colors Edition combines a diverse selection of colors with on-trend motif ideas. Six STABILO Pen 68 sets provide fresh inspiration, and with a unique selection of colors for the popular themes of Avocado, Flowers, Happy, Llama, Narwhal and Watermelon, your creativity will know no limits! The sets of STABILO Pen 68 Living Colors are made up of eight selected colors. Color-intensive premium felt-tip pen for strong lines and large areas. Available in 40 colors, 6 fluorescent colors and various ranges. The pen offers a robust M-tip (line width approx. 1mm) for even ink application that can be perfectly used for bold lines and large areas. You can also create aquarelle masterpieces by blending colors using just a brush and some water. STABILO Pen 68 comes in 47 brilliant colors. Here are some of the most favorite ones! STABILO Pen 68 individual pen is rated with the mark B – excellent level. Products with this rating have high level of overall sustainability performance. This typically reflects product environmental features above the market average, often together with limited impacts in manufacturing and commitment in company management. The STABILO Pen 68 wallets are rated with a C-level score that stands for a plus level of sustainability. Products of this category have an average overall sustainability performance, commonly reflecting standard products features, often combined with average practices in manufacturing and company management. 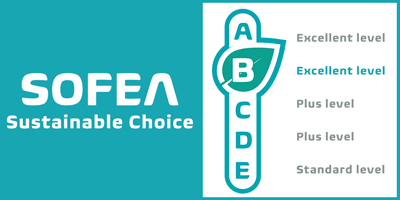 PDF Download of the SOFEA scorecard for STABILO Pen 68 single pens. PDF Download of the SOFEA scorecard for STABILO Pen 68 wallets.